This beaul little mushroom, which grew in such abundance last year, has given me some lovely soft greens, but I wanted to see if I could encourage it to give some of the blues I know it’s capable of achieving. So our mushroom interest group—about ten interested members of the Sunshine Coast Spinners and Weavers Guild—focused on this one at our last session. I’ve had good results by soaking the mushrooms overnight in water with the pH raised to 12 with ammonia, but this time I decided to use washing soda because we’d be cooking the mushrooms indoors, and the odour of washing soda is decidedly less caustic than that of ammonia. I also wanted to try other methods of bringing out the colour, along with a few mordants for each method. 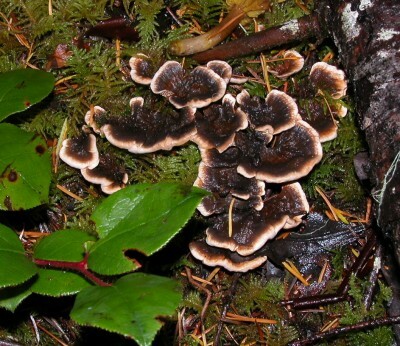 Mushrooms were soaked overnight in well water (pH 5.8). 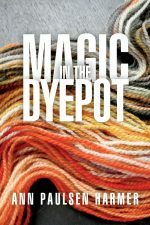 The following day, the skeins were added to the dyebath, which was brought to a slow simmer until the skeins were fully dyed. Mushrooms were soaked overnight in well water brought to a pH of 12 with the addition of washing soda. 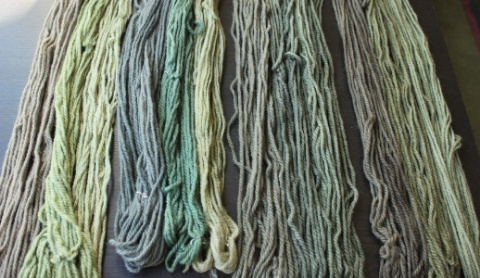 The following day, the skeins were added, then the dyebath brought to a slow simmer until the skeins were fully dyed. Mushrooms were soaked overnight in well water, then brought to a temperature of 170 degrees F. The dyebath was held at this temperature for 15 minutes, at which time the skeins were added and simmered until fully dyed. We were pleased with the beauty of all of these colours, and I think I’ve convinced a few more potential mushroom dyers to enter this “dark hole”!